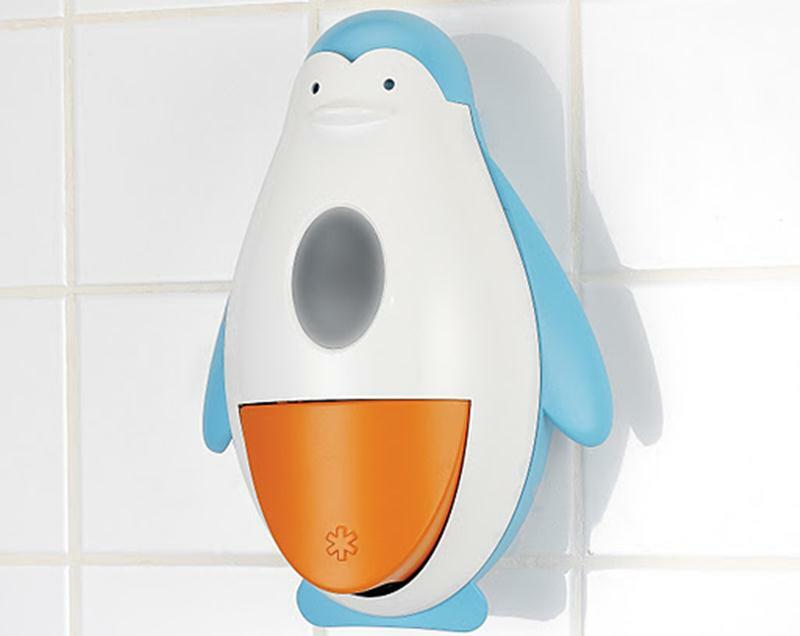 Because parents only have two arms, the adorable Skip Hop Penguin Soapster Foaming Soap Dispenser comes in very handy. This cute soap dispenser allows you to grab some soap with one hand, while holding onto your slippery baby with the other, making tub time washing fun and convenient. You don’t need to remove the penguin from the wall to fill it up, and the dispenser is refillable, making it a greener choice than multiple plastic bottles of soap. Now you can buy non-toxic soap in bulk! Plus, as your child ages, he’ll be able to press penguin’s belly to lather up all by himself. This dispenser easily mounts to tile or glass with suction, adhesive or screw plates, and the convenient window shows when you’re running low on soap. This set is also BPA-free and phthalate-free, helping to keep bath-time less toxic. Because parents only have two arms, the adorable Skip Hop Penguin Soapster Foaming Soap Dispenser comes in very handy. This cute soap dispenser allows you to grab some soap with one hand, while holding onto your slippery baby with the other, making tub time washing fun and convenient. You don't need to remove the penguin from the wall to fill it up, and the dispenser is refillable, making it a greener choice than multiple plastic bottles of soap. Now you can buy non-toxic soap in bulk! Plus, as your child ages, he'll be able to press penguin's belly to lather up all by himself. This dispenser easily mounts to tile or glass with suction, adhesive or screw plates, and the convenient window shows when you're running low on soap. This set is also BPA-free and phthalate-free, helping to keep bath-time less toxic.